Can I leave my puppy with other dogs? Puppies are “mouthy” and they like to chew. And kids love puppies and are loud and rambunctious and encourage rough play. Toys. Make sure your puppy has plenty of toys of their own. Encourage your children to give the puppy a toy every time the puppy gets too rough. Games. Encourage good games. Games of catch or puppy ping-pong are good. Games of tug and chase me encourage rough play. Pecking order. Make sure your kid is higher in the pecking order than your puppy. Let them feed the puppy. 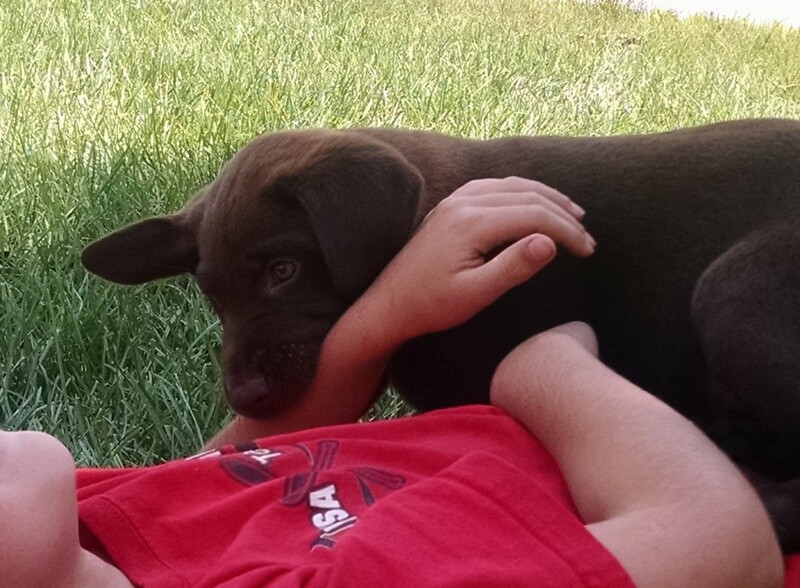 Pay more attention to your kid in front of your puppy. Let them sit next to you. Have them make the puppy do puppy pushups. Leash. Leave a leash attached to your puppy so you can quickly stop them from lunging at a child. Or quickly pull them back off a child. Affection. Show your child how to pet the puppy’s body or chest instead of the head. Limit hugs. (Dogs find hugs very stressful.) Have them rub the puppy’s ears instead. Time out. You should also have time when the puppy watches the kids playing and doesn’t get to join in. Keep your puppy on a leash while the kids play a loud game outside. Work with the puppy to stay calm until it’s the puppy’s turn to play. This will teach them to stay calm around the kids even when the kids aren’t calm. We have a 10 week old Shepherd/Lab that was a rescue puppy. The biting is HORRIBLE. I think she was taken from her litter mates too young and never learned the art of “socializing”. We have tried the ignoring, going limp, saying “no”, yelping like a bitten pup, loud noises for distraction, having plenty of chew toys, and yesterday even a water bottle. Everything seems to make her more agressive – not less. Help! We go to work all “battle scarred” and it’s getting worse.